Here’s a set of useful tips for Split that travellers to the city might find come in handy! There’s a good cluster of left luggage places around the bus station, which is adjacent to the port…and the train station. So if you arrive in Split using any of these transport options, you’re be absolutely fine with leaving your luggage in this area! You’ll find a traditional garderoba (which essentially means left luggage) in the bus station, but there are also little huts (which resemble portacabins) as well as little shop-like premises. The train station has locker-type left luggage facilities, which may be more suitable for those with smaller luggage, or who want to cram a few small items into one locker. Different places charge different rates – some only do a day rate (meaning, it’s one price however long you leave your luggage) of 30 Kunas whilst others do charge by the hour (5 Kunas/hour) so consider how long you’ll be leaving your luggage to get the best price! If you visit Split, you’ll find lots of useful travel amenities clustered around the aforementioned bus station/port/train station – and bureau de change, or places to exchange your money, are no exception. Look out for one of the huts – they offer pretty decent exchange rates. Split Airport, perhaps notoriously, has a terrible selection for eating and drinking whilst you’re waiting to board. There’s really only one little cafe/snack place that’s rather overpriced and, rather annoyingly, seems to be the only place you can buy water at. Much better to bring your own food and drink – or wait until you’re on board your plane and then you can get ripped off by the low cost airlines. The ‘duty free’ shop is a bit better, and there’s a decent selection of alcohol (wine and spirits), chocolates, cigarettes and even some foodstuffs such as prsut, paski sir (Pag cheese), olive oils and more. 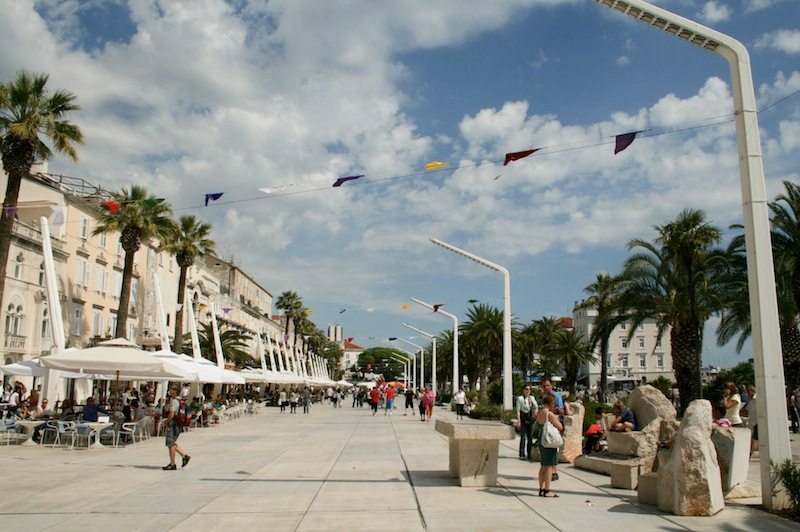 Split’s famous Bacvice Beach is home to an open air cinema (Kino Mediteran) every summer, with all types of film screenings – kids films, Hollywood blockbusters, European films and more! More details on the Kino Mediteran website.